You can set e-mail to SMS alert forwarding by configuring Ozeki SMS Gateway's built-in SMTP server. You will see how to configure it on the following page. An enabled SMTP server has it's own Email domain, so you can send e-mail messages to this domain. The local-part of the receiver's Email address should be the phone number targeted by the SMS. For example you can send an e-mail to +441234567@smsgw.yourcompany.com. The subject and/or body of the e-mail is sent as an SMS alert to +441234567. Using the domain name is not obligatory, you can use the IP address of your Ozeki SMS Gateway as well (Figure 1). Keep in mind that the built-in SMTP server of Ozeki SMS Gateway cannot forward e-mail messages to other Email servers, so if you connect your Email client to Ozeki SMS Gateway's SMTP server, you can only send e-mails to SMS Gateway. The difference is that in your computer (e.g. 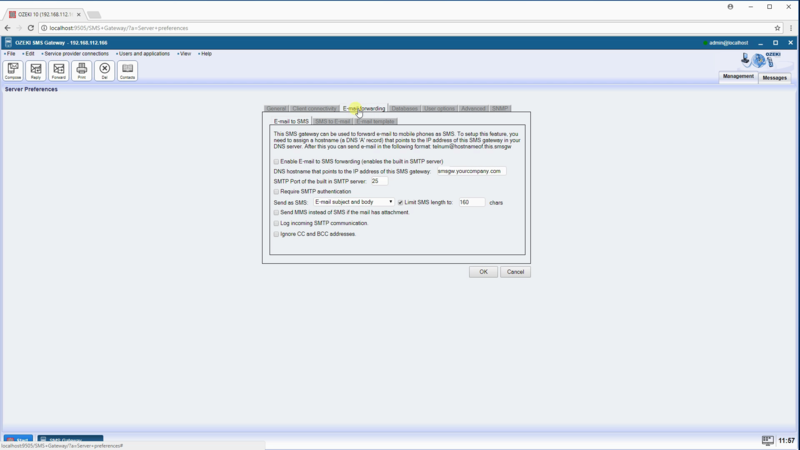 192.168.0.11) you should configure your company's SMTP server (e.g. smtp.company.com), which will forward some of your mails to Ozeki SMS Gateway. For example if you send an email to +441234657@sms.company.com, the subject and/or body will be sent to +441234567. When using this configuration you should create a DNS entry to Ozeki SMS Gateway (e.g. sms.company.com -> 192.168.0.10). The reason for this is that most companies' email relays will not forward emails to IP addresses. This is why +441234567@192.168.0.10 is not a valid email address. You should use +441234567@sms.company.com instead for your messages to be forwarded to Ozeki SMS Gateway. Emails to SMS (e.g. sms.company.com). These messages should be forwarded to Ozeki SMS Gateway. Do not forget to set the domain in the DNS table.